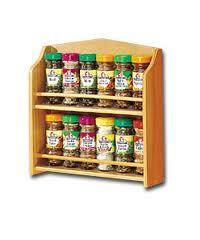 Medicine chest or kitchen cabinet? Over the past weeks, some nasty and exotic substances from nineteenth-century medicine chests have been presented. Today however, I am going to focus on some substances that are commonly found in nineteenth-century medicine chests, but that are also still in most kitchens today. “Spirit of Hartshorn” for example, sounds very mysterious, but is in fact nothing more than an ammonia solution. The Romans called the ammonium chloride deposits they collected in ancient Libya ‘sal ammoniacus’ (salt of Amun) because of proximity to the nearby temple of Amun or Ammon. Before the mid-nineteenth century, this compound of nitrogen and hydrogen (NH3) was usually made from horn shavings, hence the name ‘spirit of hartshorn.’ We now keep its chemically manufactured equivalent in our cleaning cupboards. In medicine chests the substance can be found under various names, such as Liq. Ammon Fort., and it was used to treat stings and insect bites, as it reduces pain an irritation of the skin. Ginger, either dried and powdered or in the form of an essence, was advised in all kinds of ailments, but particularly in cholic and gout. It was thought to be warming, and with a more lasting effect than other spices. Rhubarb and ginger were also often combined, most famously in Gregory’s Powder. This mixture of rhubarb, ginger and magnesium carbonate was one of the most common self-prescription medicines for over a hundred and fifty years after it had been developed by James Gregory (1752-1821), a professor of physic in Edinburgh. Clove oil may not be in your spice rack, but cloves, whole or powdered, probably are – and even today sucking on a clove may alleviate a toothache, albeit temporarily. Clove oil can also still be purchased in pharmacies without a prescription. This is because the active ingredient, eugenol, is a natural analgaesic and antiseptic. For that reason, clove oil is found in so many medicine chests from the nineteenth century, especially in chests that were assembled for travellers. They could easily find themselves many days away from a dentist, and then clove oil was their first resort. All this shows that while many nineteenth-century drugs were ineffective or even harmful, some were innocent and even quite useful. Quinine – most of us have heard of it and associate it with the treatment of malaria. Recently a certain manufacturer of soft drinks even mentioned it again in a sort of mock-colonial advert for tonic water. Although tonic water was indeed originally mixed as an anti-malaria treatment in tropical regions, what the ad does not mention is that our tonic water contains less than 20 milligrams of quinine per 1.5 decilitre, whereas the recommended quinine dosage for treatment of malaria is two or three 200-350 milligram tablets three times a day. In several of the medicine chests at the National Maritime Museum, preparations of quinine are also found, including quinine disulphate in a chest that was used by the ill-fated Franklin expedition to the Arctic (1845). Searching for a North-western passage to Asia, all 128 men died after their boats got stuck in the ice in the Canadian Arctic. Seen through twenty-first century eyes, it may seem very odd to take anti-malaria drugs on an Arctic expedition. Upon closer investigation, it is not as strange as it seems. 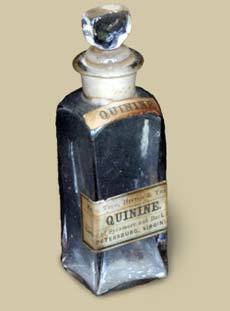 A nineteenth-century bottle of a quinine preparations, like the one in the chest of the Franklin expedition. Quinine, an alkaloid made of the bitter red bark of the cinchona tree, was ‘discovered’ in Peru in 1631. It was no chance discovery – the Quechua already knew it, but malaria was not indigenous to the new world. In fact, the discovery of the usefulness of quinine in malaria by a Jesuit apothecary was the result of a search commanded by Pope Urban VIII, after ten cardinals and hundreds of their attendants who came to Rome to elect a new pope died in the Roman marshes in 1623 from ‘bad air’ or, in Italian, mal’aria. Reiter, Paul. “Global warming and malaria: knowing the horse before hitching the cart”. Malaria Journal 7 (2008): suppl. 1. About two weeks ago, I had coffee with the head of the conservation department of the National Maritime Museum. She asked me if I could mark the bottles and containers from the medicine chests in the database that had potentially hazardous substances in them. As I compiled a list of all the substances and their contemporary uses for my research project anyway, I promised her to do so. Obviously, many of the substances in the chest can be hazardous if you would swallow an entire bottle at once, but the conservation department is particularly interested in substances that are either a health risk if not properly stored, such as mercury, and substances that are subject to legal regulations, such as opiates. Even if the opium is over a century old, you still need a license to keep it! And as a matter of fact, there are quite some hidden opiates and mercury in the medicine chests. Some of them are quite easy to recognise, because their label reads something like ‘Hydr.’ (hydrargyrum; mercury), or ‘compound powder of chalk with opium’, and anyone who has ever read a Victorian novel will know laudanum should not be spoon-fed to infants – although one can imagine it would make them very calm. However, others are less straightforward. Grey powder, blue pills, Dover’s powder, paregoric elixir, and calomel or calamel all contain mercury or opium. 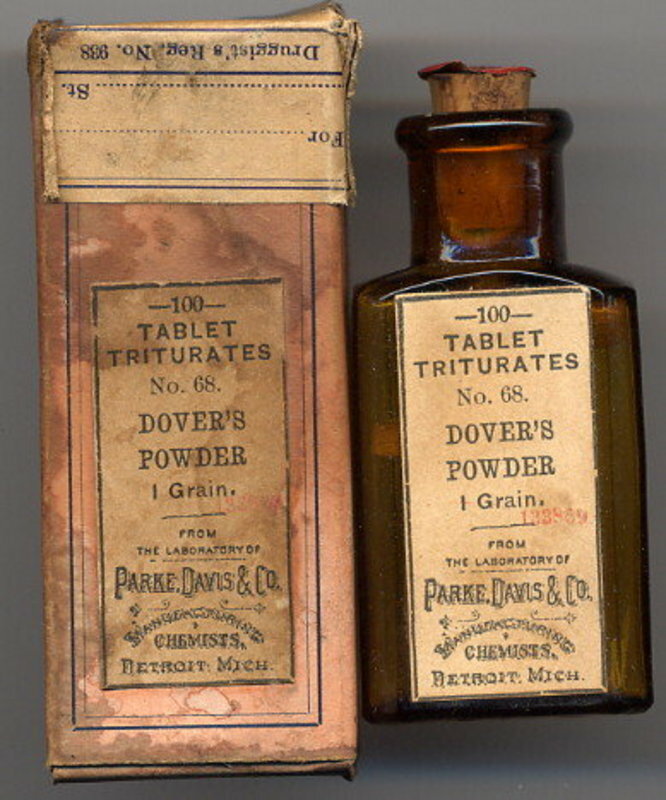 A late nineteenth century bottle of Dover’s Powder – advertised as fever medicine. But Dover was certainly not the only or the last physician to subscribe mercury-based drugs to his patients. Medication with mercury as the active ingredient was used in the treatment of venereal and skin diseases up to the early twentieth century, and in the nineteenth century they could be found in both traveller’s and family medicine chests in abundance. Turnbull in his 1806 book The Naval Surgeon writes that John Clark in 1773 was the first to use calomel (mercury chloride) in dysentery in ‘hot countries’. For more on Thomas Dover and quicksilver doctors, see Swiderski, Richard M. Quicksilver : A History of the Use, Lore and Effects of Mercury. Jefferson, NC: McFarland, 2008.